Home → Coupon Codes → Vaptio Coupon Code! Save 40% OFF! For a limited time only, Vaping Cheap readers can save 40% off on select products using coupon code “Vaptio40“! This makes Vape Pens as low as only $5.99 and their 240w Kit only $23.99! 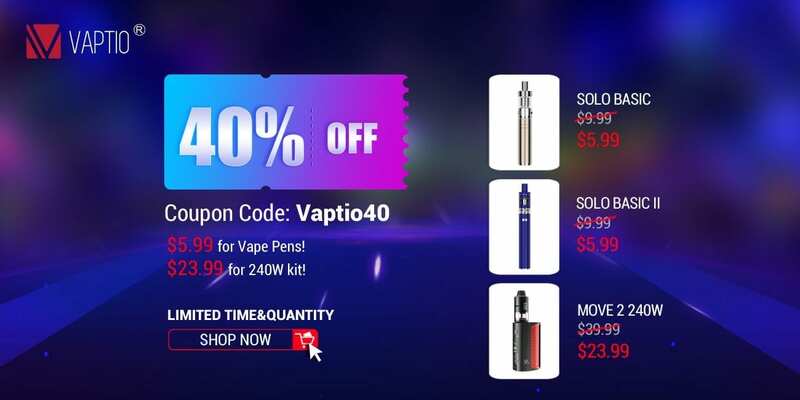 The Vaptio coupon code will save you 40% off select vape products with prices as low as only $5.99 for a Vape Pen and only $23.99 for a 240w Kit! The products this coupon code applies to is the P1 Mini S Kit, N1 Pro 200w Lite, Move2 240w Kit, Solo Mini, Solo Basic II, Solo Basic, C-Flat, P-III, N1 Pro 240w, P-II, P-III Gear, P-1 Mini, P-1 TF Kit, C-II, Move 60w, Move 50w and Fusion 3.8ml S150 Kit. All in all, this is an excellent coupon code! If you’re interested in picking up a new vape kit or vape pen at cheap prices, then this is a coupon code definitely to take advantage of! Make sure to check out this deal at Vaptio, where you can save 40% off using the provided coupon code! This coupon code is valid for a limited time only! In addition, there are limited quantity available!